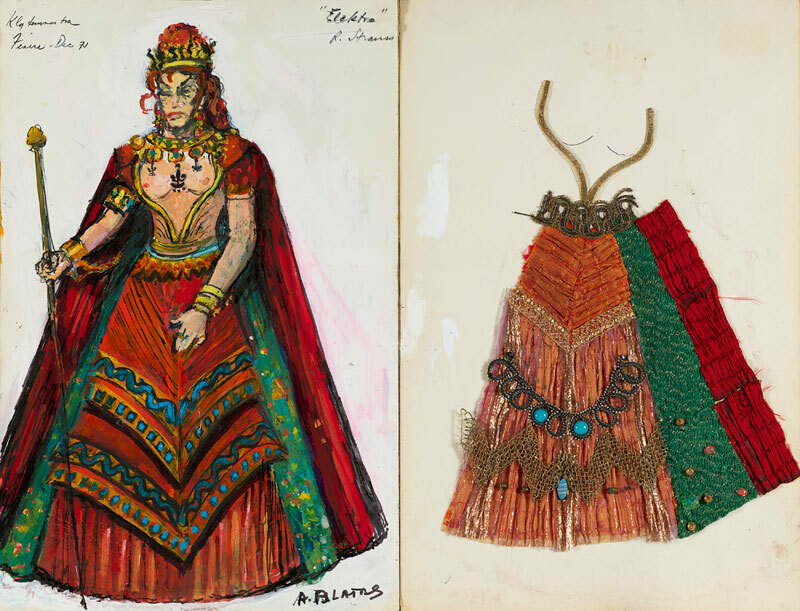 Regina Resnik as Klytämnestra: "Dyptich"
This one-of-a-kind work by Blatas was a study of Ms. Resnik as Klytämnestra and a costume design for the production he and Ms. Resnik produced for Teatro la Fenice, Venice, in 1971. The bodice (left panel) includes a breast piece. Right panel shows the costume swatches used in the production. Signed A. Blatas lower R. of left panel. Ms. Resnik's notes upper corners of L. panel. Gouache / black marker on paper. Each panel is 13.75 x 21.75 in.